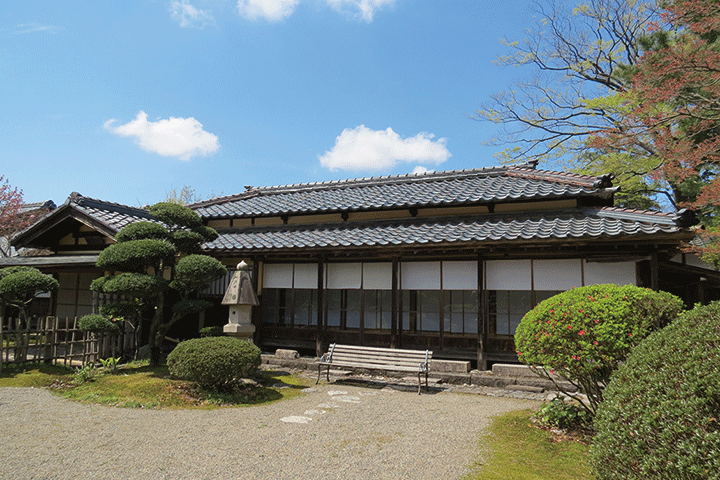 This exhibition is full of newly created Niigata traditional crafts. 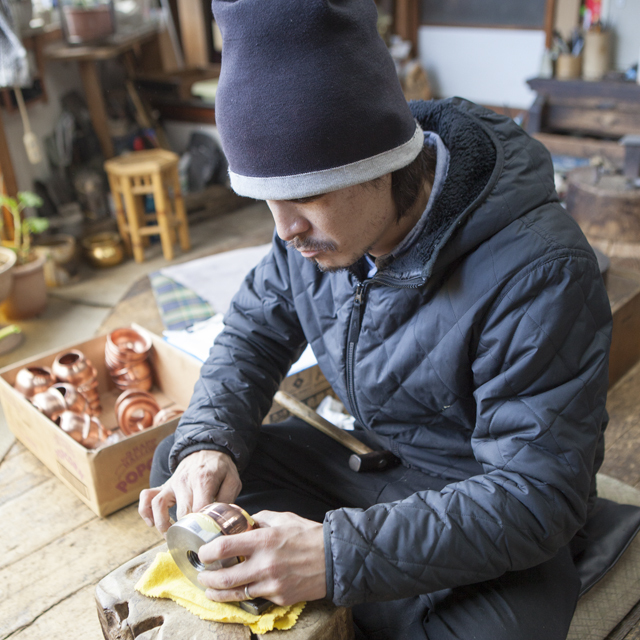 We are so pleased to hold workshops with the craftsmen for visitors on 5th May. Please come and join us! 2018 3 May Thu./Holiday ー 6 Sun. 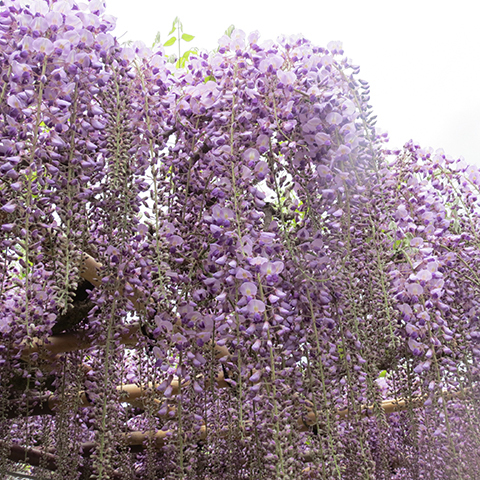 Site:Tokiwaso The old tea house is located behind the massive blooming wisteria on the premises. Date: 2018 5th May Sat. 10:00〜16:00 ※Ms. Haga’s workshop may close when she runs out materials. 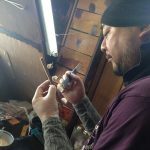 Fee: 1,000yen includes consumer tax. Available attend on the day, available reservation. Please contact us regarding the workshop on 5th May. We can reserve a space for you. 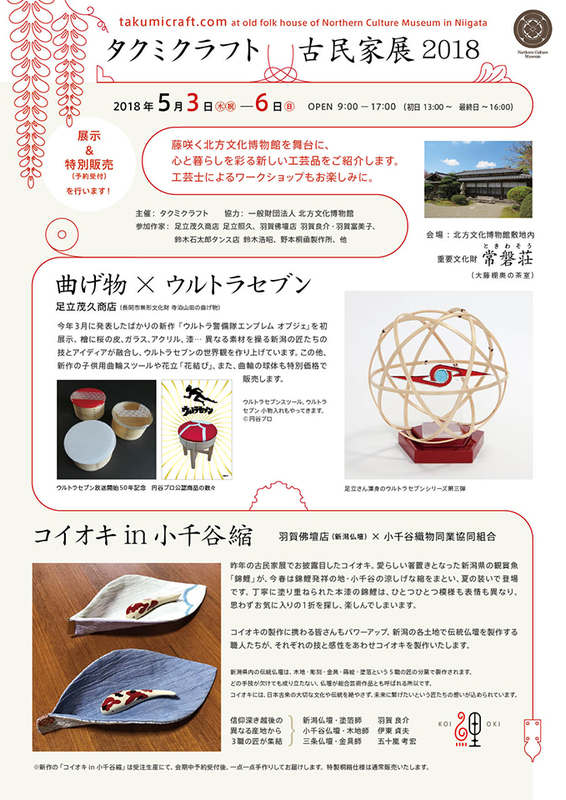 We look forward to welcoming you to the exhibition and feast your eyes on the new and awesome lineups of Niigata Traditional Crafts! 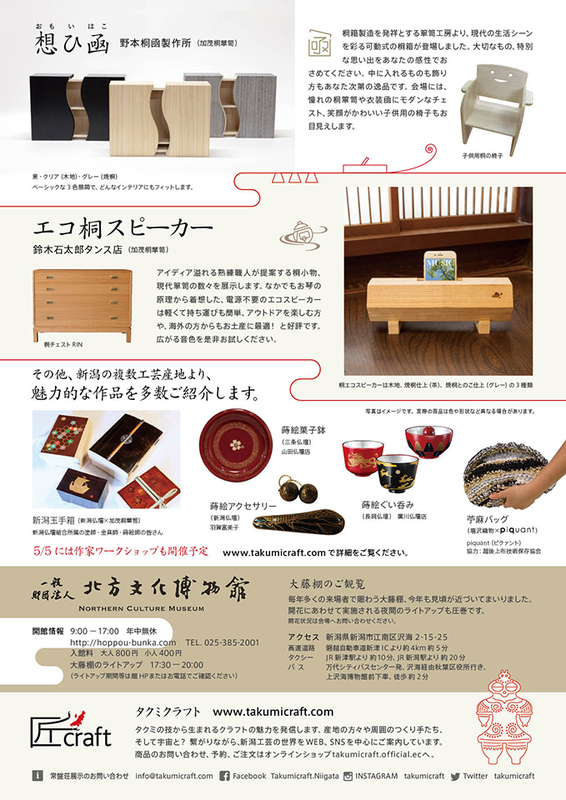 Please refer to http://hoppou-bunka.com/english for the direction. The first public viewing of the Ultra Series, ‘Emblem display of Ultra member’ in this exhibition. 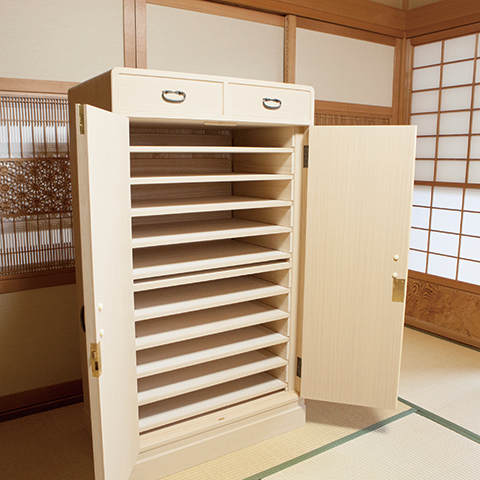 This is the newest creation by ‘Adachi Shigehisa Shoten’ and ‘Tsuburaya Production’. It is made of Japanese cypress, Cherry bark, glass, acrylic, lacquer and so on. 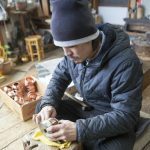 These materials have been turned into an amazing ‘Ultra Seven’ world through Niigata craftsmen’s well-horned skills, ideas and passion. 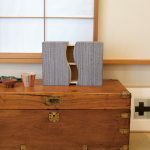 And also, we have a new child stool and a product called ‘Hana-musubi’ which is a stylish container of small vase on sale at the exhibition prices. 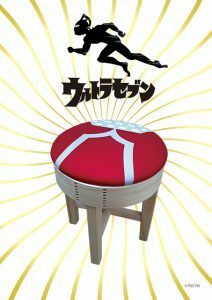 Other exciting Ultra Seven goods such as stools and small treasure boxes are also on sale. This is the first time for 3 Ultra Seven items on display at once. 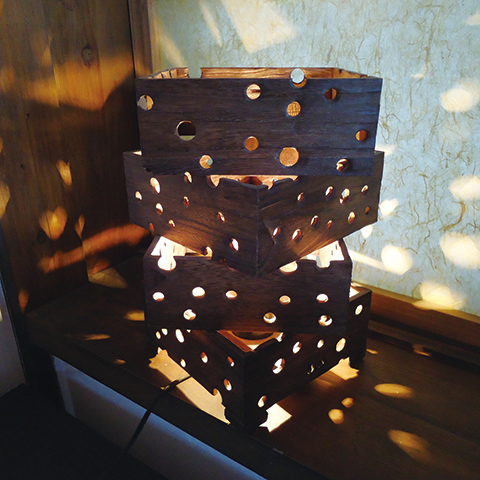 ‘Koioki’ was introduced in the same exhibition ‘Kominkaten’ last year. 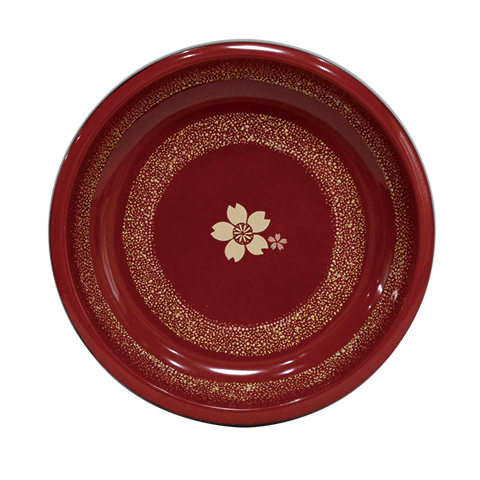 This lovely Hashioki is based on ‘Nishikigoi (Niigata’s world famous Japanese Carp)’. Ojiya is also famous for Nishikigoi (Japanese carp) which Koioki comes from. Discarded pieces of the weaved cloth were used for Koioki Coasters. 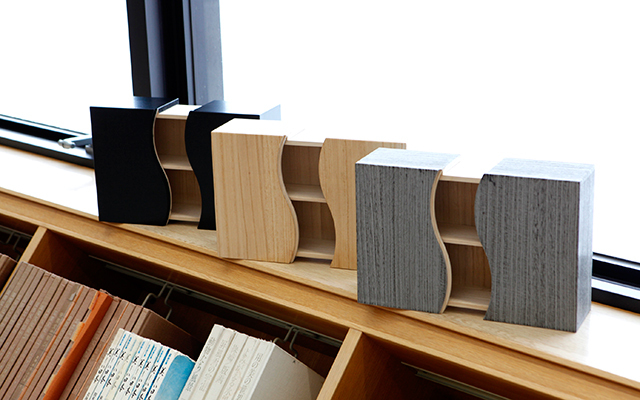 The leaf shaped coaster has a specially created metal fitting by Takahiro Ikarashi, Sanjo Butsudan. They are coated with genuine Urushi repeatedly in a careful manner so that each pattern and impression look differently. 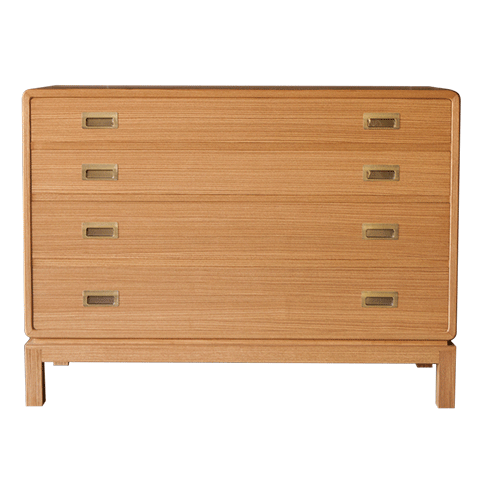 Why not choose one you like from the beautiful collections! 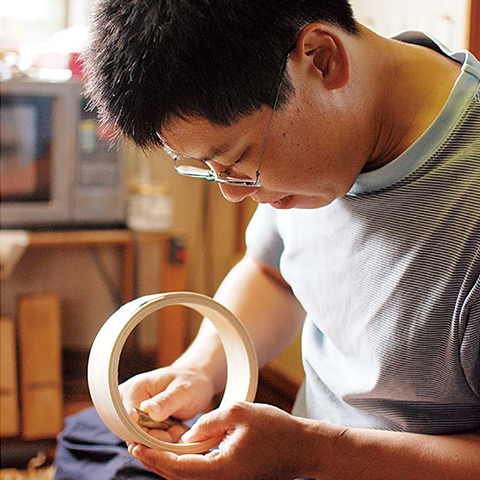 Religious culture in Niigata produced these 3 experienced craftsmen and they got together from 3 different areas. 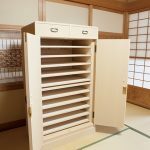 The traditional Niigata Butsudan is made by 5 stages such as wood carpenter, carver, refiner, lacquer and luster craftsman and lacquer painter. 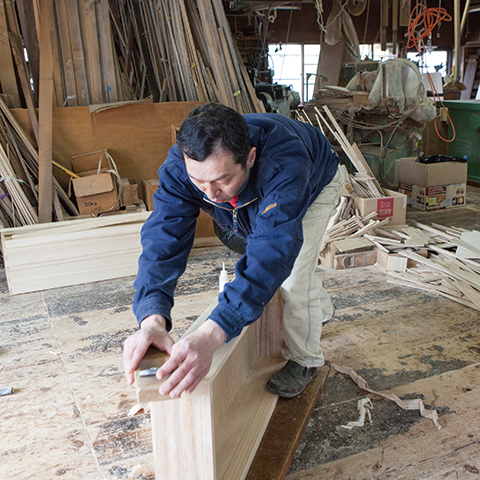 Highly specialized craftsmen work on each stage. Butsudan must be completed with these 5 stages, for this reason, it is called a combined art. 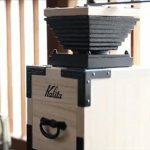 ‘Koioki’ has been created from the craftsman’s wish to continue our heritage, culture and tradition, and pass them down to the future generation. 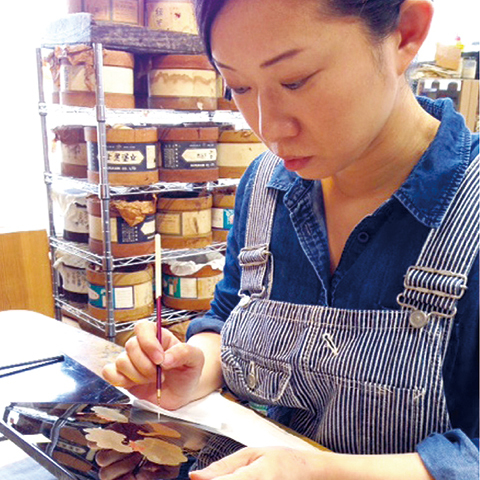 Fumiko Haga is painting picutre on Koioki. 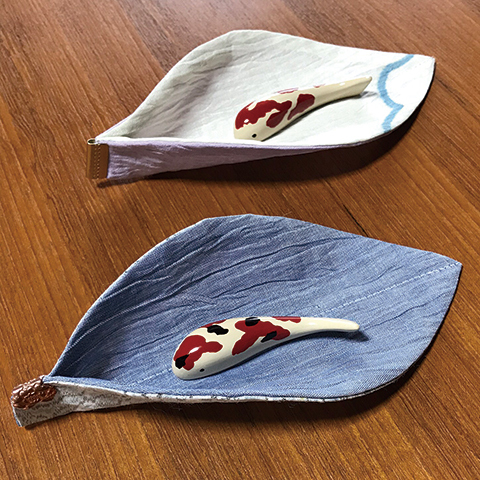 ※New ‘Koioki in Ojiya chijimi’ is order made. 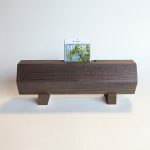 ‘Koioki in Kiri Box’is also on sale. 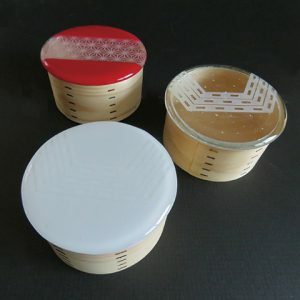 ‘Nomoto Kirihako Seisakusho’ offers now a new kind of Kiri box products to enhance your life style. 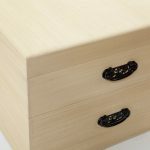 Although ‘Omoihako’ is a kiri (Paulownia) box, it opens and closes sideways.Nomoto Kirihako Seisakusho located Kamo area and originally kiri box maker. 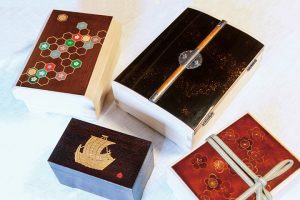 Please use it as a treasure box or a display case for your favorite items and collections.There are 3 colour choices – black, clear (natural), grey (burnt). We are quite confident that you will find one you like. 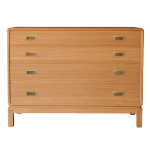 There are a closet and a modern chest draws made of Kiri on display. 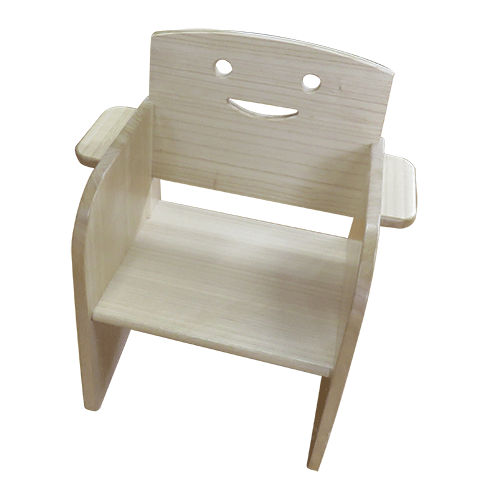 Cute child chairs are also available in the exhibition. He shows various accessible goods and some stylish modern furniture all made of Kiri. This is a unique wooden compact speaker specially created by ‘Kamo Kiri Tansu’, the craftsmen who poured into their skill, care and attention for each one of them. 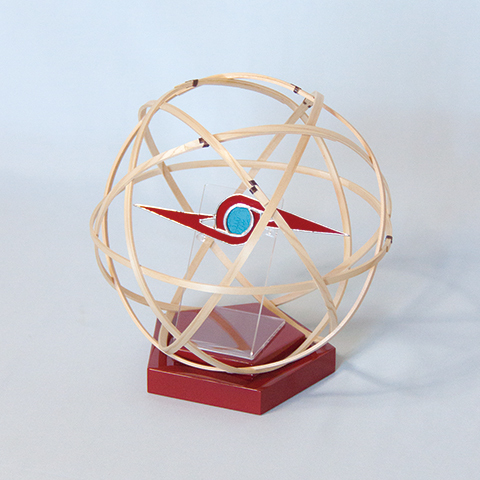 The amazing eco-friendly feature is that they run without any electricity or batteries. 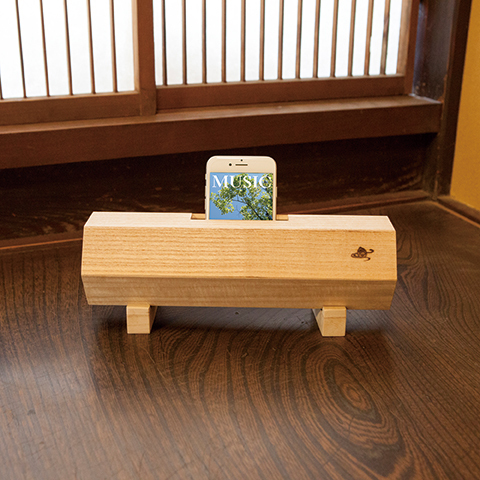 Top quality Japanese Kiri wood was used for the soft melodic sound it creates. 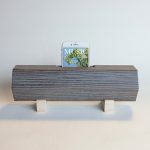 The Japanese traditional Harp called ‘Koto’ is also made from it, because the Kiri wood produces good acoustic sounds, and perfect for wooden speakers or music instruments. The sound from your Smart Phone spreads tenderly through the wooden cavity just like the smooth touch of its polished surface. It is a compact, light and portable unit. You can enjoy music anywhere you wish. 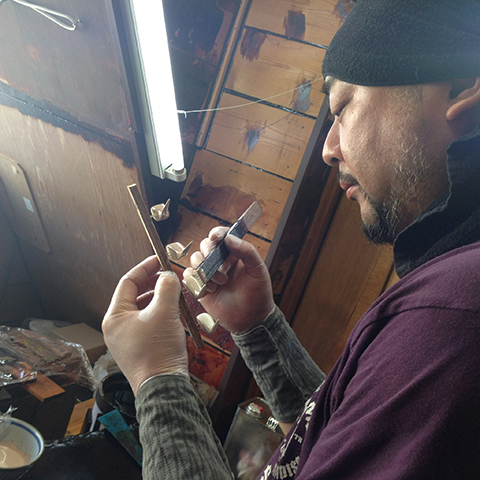 Experienced three skilled Urushi Painters were involved in the creation of new attractive Kiri product. This is a challenging attempt between Kamo kritansu craftsmen who made the frame, and Niigata butsudan craftsmen who attached ornaments and painting. 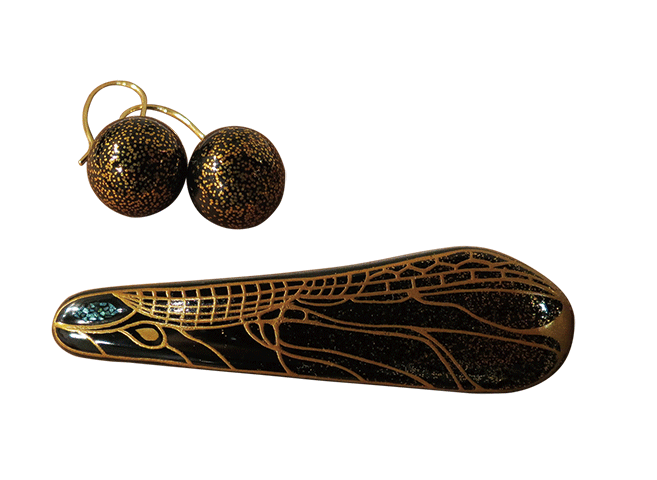 Lacquer painted accessories reflect highly developed delicate brush strokes and unique original patterns by the creator. They grab your attention for the beauty undoubtedly. They are gorgeous to look at but even better on. 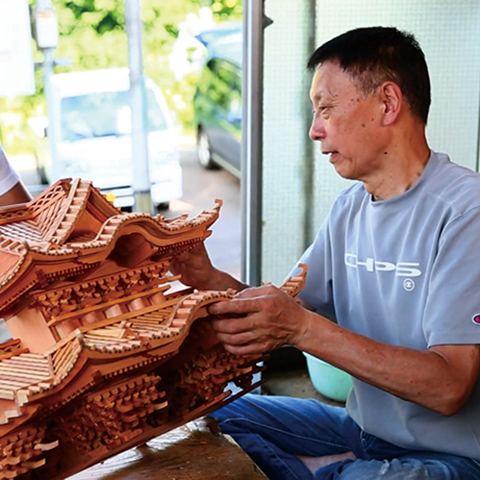 Don’t miss them at the exhibition! The Sake cups are made of aluminum. Some says that it improves the taste of Sake. You must try it and find out yourself! 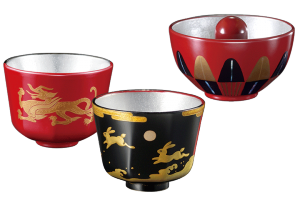 The lacquer sake cups have awesome patterns and pictures which require highly developed skills of Nagaoka Butsudan. 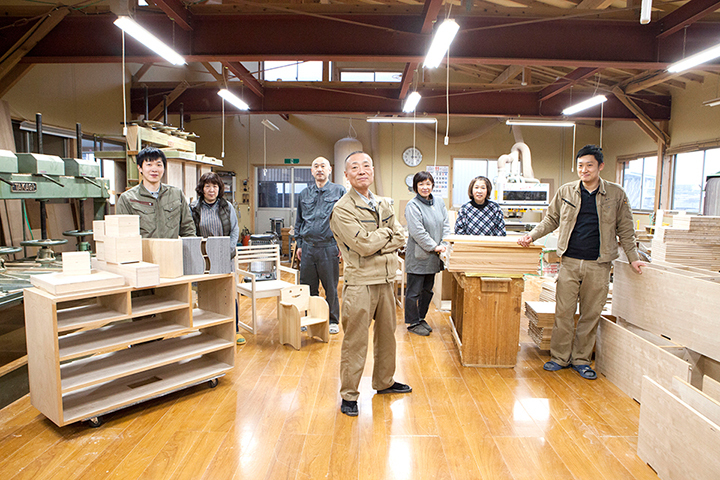 Saeka Katayama makes a unique bag for each customer after having a detailed discussion about styles and preferences before creating begins. 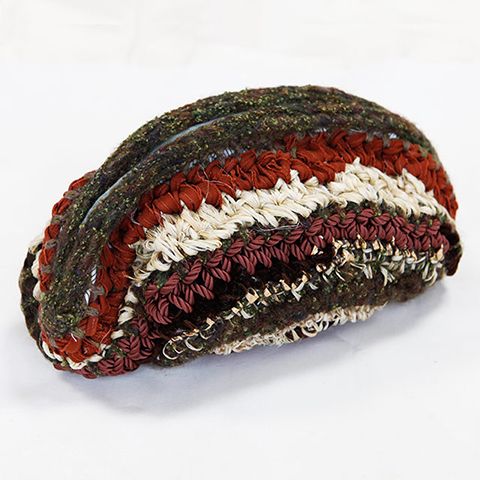 She uses beautiful antic laces and ribbons from overseas and weaves them to produce an only braided bag for the customer. 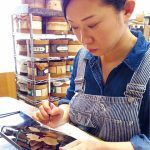 All her creations are made by hand. Shiozawa’s climate and clean water were essential for producing a good material called Choma. Choma is sparsely for her creations. All photos are images only. Colours and shapes may look differ from actual products.